As it turns out, this is not advertising puffery. The burgers are juicy and tasty. 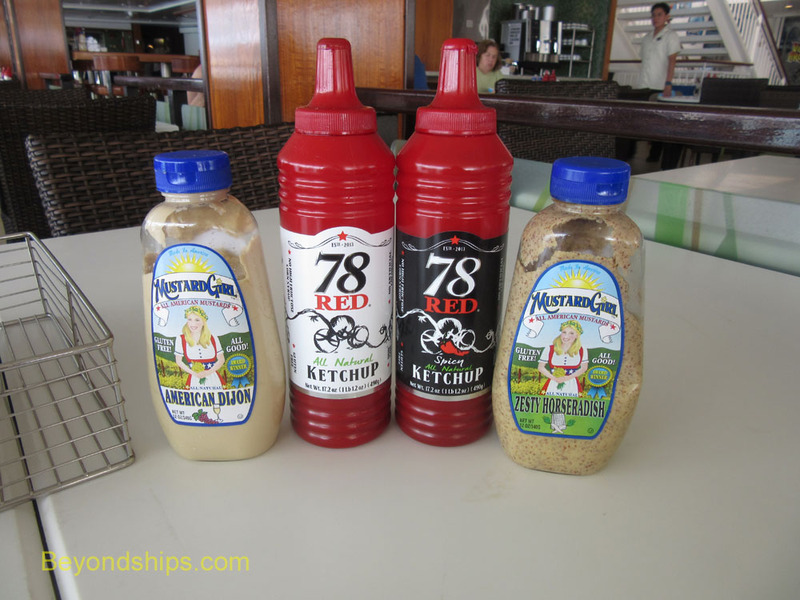 Indeed, they are more flavorful than the burgers offered elsewhere on the ship. This is especially surprising because such large (eight ounce) burgers are usually either overcooked or raw in the middle. The meat is only one element of a great burger. While most hamburger buns are tasteless and useful only for picking up the burger, a good bun can really enhance the taste. At the Uptown, you have a choice of an Italian bun or a country bun. The latter is particularly good, soft and flavorful. Then there are the toppings. 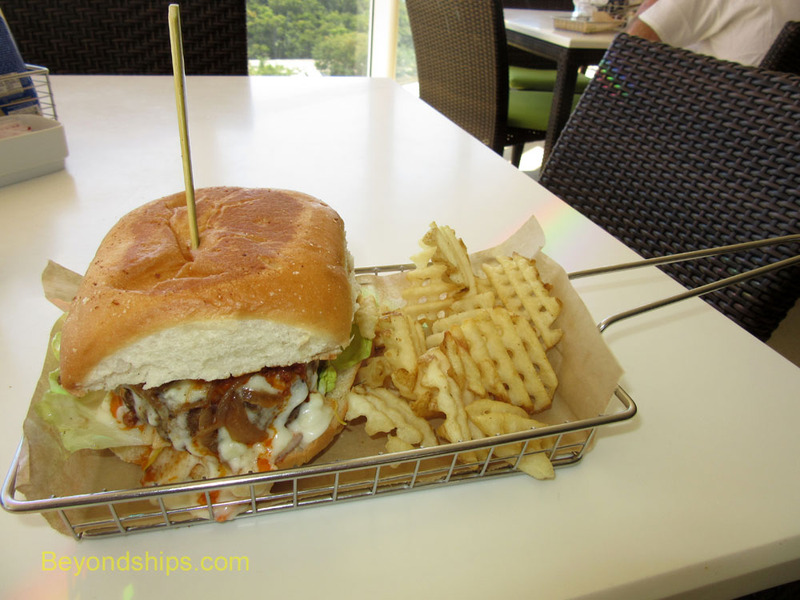 The Uptown offers three signature burgers in addition to the UBT Original Burger. These differ in the toppings. All of these come on a country bun, have a mustard and mayonnaise spread and come with Boston lettuce, frisee, red onions and Sriracha cabbage cole slaw. However, the Garden and Herb has watercress, basil, cilantro, alfalfa, and celery leaves while the Cowboy has Jack Daniels BBQ sauce, bacon, mushrooms and Monterrey Jack cheese. The Chili Cheese, not surprisingly, has chili and American cheese. The main advantage of choosing one of these burgers is that these combinations have proven pleasing over thousands of customers. But for people who know what they like, the Uptown offers the opportunity to design your own burger. Guests can choose from a long list of cheeses, sauces and other toppings to make the burger of their dreams. You can even dispense with the beef and substitute a turkey burger or a veggie burger in its place. All of the burgers come with waffle fries. These were usually quite good. However, at times when the Uptown was busy, they could arrive at the table cold. At the table, you have a choice of four additional condiments - - ketchup, spicy ketchup, “American Dijon” mustard, and horseradish sauce.. These are a notch above the usual burger condiments. For example, the ketchup utilizes all natural ingredients and has a richer taste than the more popular ketchup brands. This brings us to a flaw in the Uptown Grill operation. 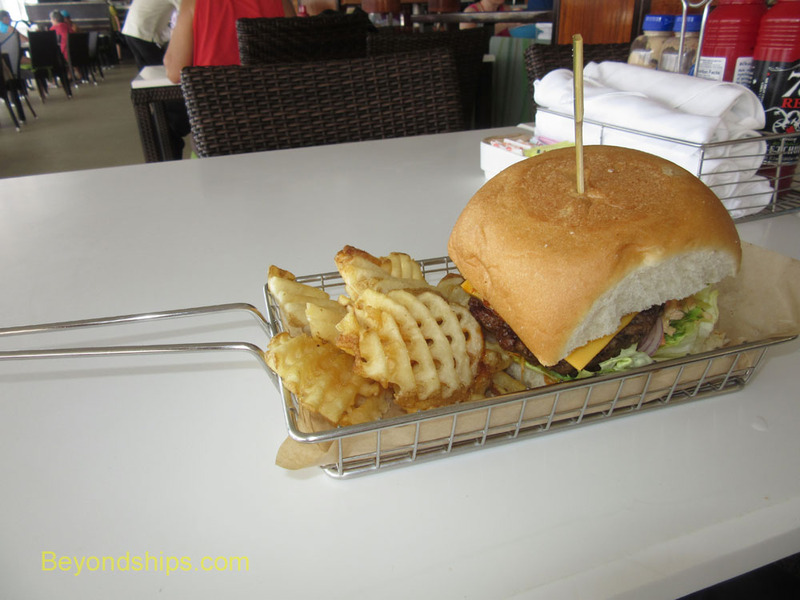 The burgers and fries arrive at the table in a metal basket with a piece of wax paper lining the bottom. If you pour ketchup or any of the other condiments on the fries in any significant quantity, it leaks out through the sides of the basket. Similarly, if you use a knife and fork to eat your burger and fries (better for sanitary reasons), the paper at the bottom deteriorates and the condiments leak out the bottom of the basket. The Uptown Bar and Grill is located high on the ship on the starboard side of Deck 16. It is sheltered by the deck above and by windows along the starboard side but is otherwise open to the elements. Consequently, it is not open on days when the weather is bad. hands you a number that you place on a holder on your table. Another staff member brings the food to your table when it is ready. The hostess usually warns that it could be 20 minutes until your burger arrives but our experience was that it was usually less time. Above: The Cowboy Burger, one of the Uptown Grill's signature burgers. Above: A variety of condiments. Above: The salad counter is next to the grill. Below: A made-to-order chopped salad. 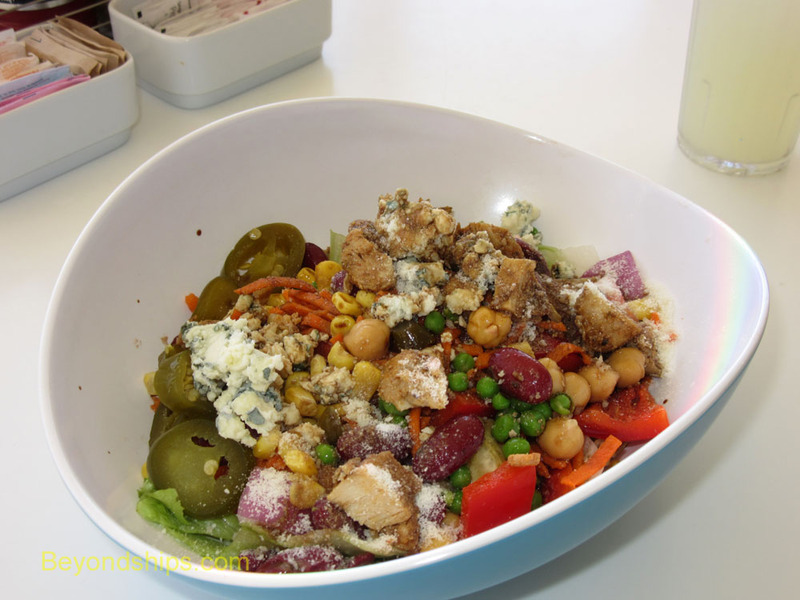 While you are waiting, you can enjoy a fresh chopped salad. Next to the grill is a salad station with an array of ingredients including vegetables, beans, cheeses, chicken, tuna and more. 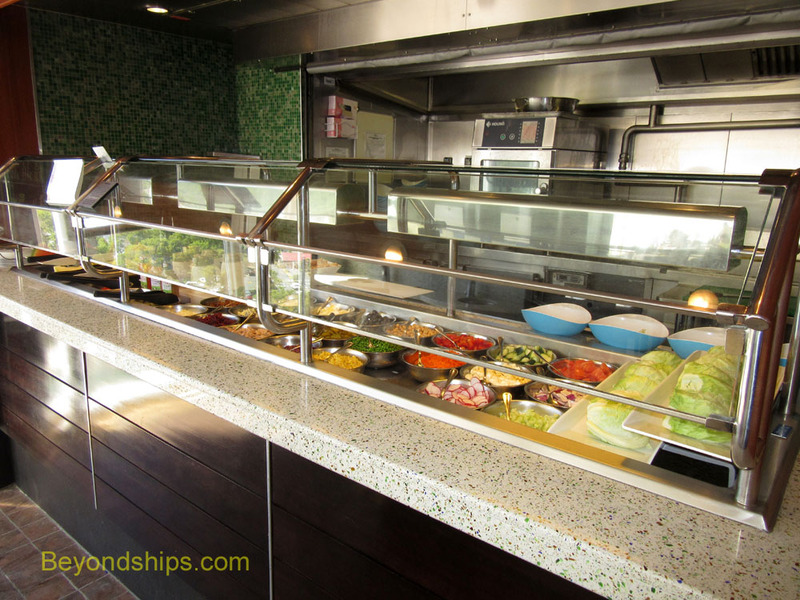 Similar to the Tuti Salad operation on the Royal Caribbean ships, you tell one of the chefs which ingredients you would like to have in your salad and he or she prepares it before you. You also have a choice of several dressings. The salads are quite large and could well serve as meals in themselves. The Uptown Bar and Grill is one of those venues that becomes popular by word of mouth. Located in a somewhat out-of-the-way area of the ship, many guests do not naturally come across it. However, as people discover it, word gets around the ship so that it is quite difficult to find a table during the peak lunchtime hours. As a result, it is best to come early. The food at the Uptown Bar and Grill is complimentary.